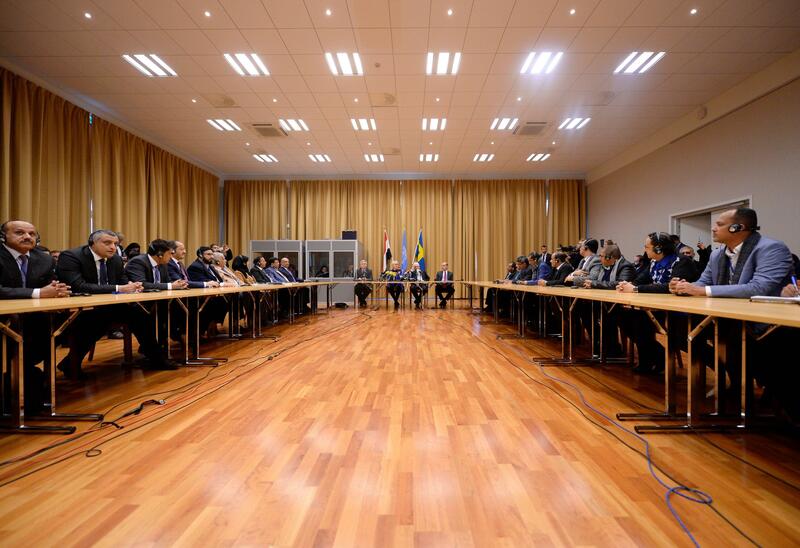 RIMBO, Sweden -- Representatives from Yemen's warring sides sat in the same room in Sweden on Thursday as U.N.-sponsored peace talks for the war-torn Arab country got underway, aimed at halting a catastrophic three-year civil war. Sweden's foreign minister, Margot Wallstrom, opened the talks at a castle in Rimbo, a town north of Stockholm, wishing the Yemen adversaries strength to find "compromise and courage" as they embark on the difficult task ahead. "Now it is up to you, the Yemini parties," she said. "You have the command of your future." The U.N. envoy for Yemen Martin Griffiths said the coming days were a milestone and urged the parties not to "waver... let us work in good faith ... to deliver a message of peace." Griffiths announced the sides have agreed on a prisoner exchange as a first step toward building confidence. He said both sides have signaled they were serious about de-escalating the fighting through calls they've made in recent weeks, and urged them to work to further reduce the violence in the Arab world's poorest nation, scene of massive civilians suffering. "I'm also pleased to announce the signing of an agreement on the exchange of prisoners, detainees, the missing, the forcibly detained and individuals placed under house arrest," Griffiths said. "It will allow thousands of families to be reunited, and it is product of very effective, active work from both delegations." U.N. officials, however, have sought to downplay expectations from the talks, saying they don't expect rapid progress toward a political settlement but hope for at least minor steps that would help to address Yemen's worsening humanitarian crisis. Meanwhile, the U.N. food agency said Thursday it is planning to rapidly scale up food distribution to help another 4 million people in Yemen over the next two months, more than a 50-percent increase in the number reached now - if access can be maintained in the poor, war-stricken country. World Food Program's spokesman Herve Verhoosel said the "ambitious undertaking" finalizes plans in the works in recent months to reach 12 million people with food and nutritional supplements through January, from between 7-8 million now. The target population includes some 3 million women and children who need special support to prevent malnutrition. Verhoosel said the rollout will require "safe, immediate and unimpeded access for food and other vital supplies."